Now that summer is almost here, you cannot but realize that the majority of people are on diets! Whether you are boycotting all the food you normally eat or are following a repulsive all-liquid diet for a relatively long period of time, you are most probably noticing an increase in stress and depressive behaviors. Well, the great news is that you can still eat out and lose all the weight you are aiming at getting rid of. And NO you do not need a diet center to lose the weight. Well, yesterday, I decided to have dinner at Crepaway and noticed that they had so many healthy, nutritious and low calories/low fat options in their menu and it came to me: do people actually know that they can follow a 100% diet by picking the right lunches from a restaurant; for example, Crepaway? 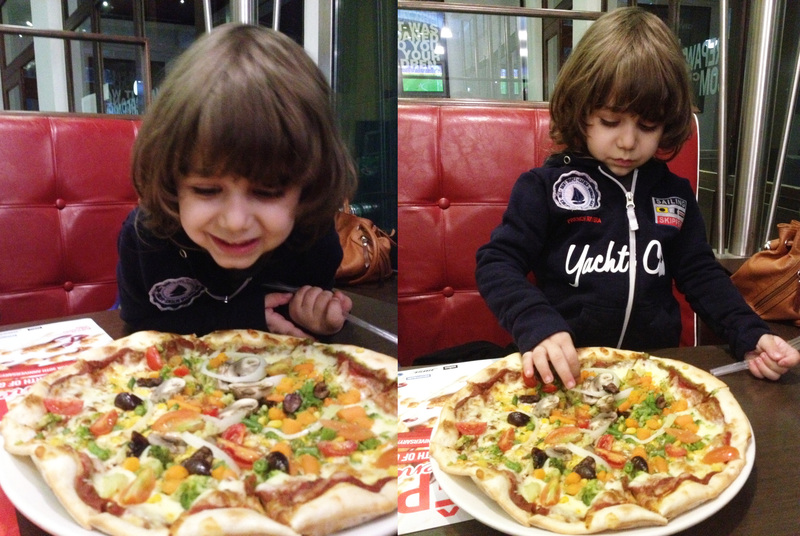 Well, I can tell you their veggie pizza is the best way to enjoy your pizza: filled with vegetables such as broccoli, mushrooms, corn, carrots, green beans, tomatoes and onions & having a crazy thin crust, I would say: GO for it!!! And it sure is yummy! My son Nathaniel definitely jumped right at it… it is filling, high in fiber and low in fat! 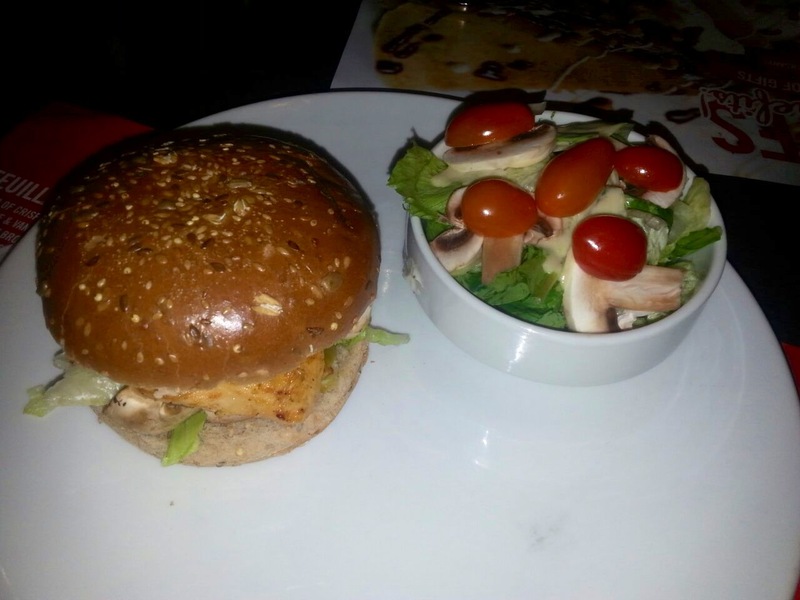 The chick’s burger is an amazing option that gives you all u need in 1 meal: the proteins from the chicken, the garlic that helps boost your immune system, the fibers from the bun and vegetables (inside the burger & side salad), the probiotics from the pickles that help maintain a healthy well-balanced digestive system. You would never think that this packed burger would actually contain less calories than a tiny piece of the kibbeh bil sayniyyeh your grandma makes!!!! 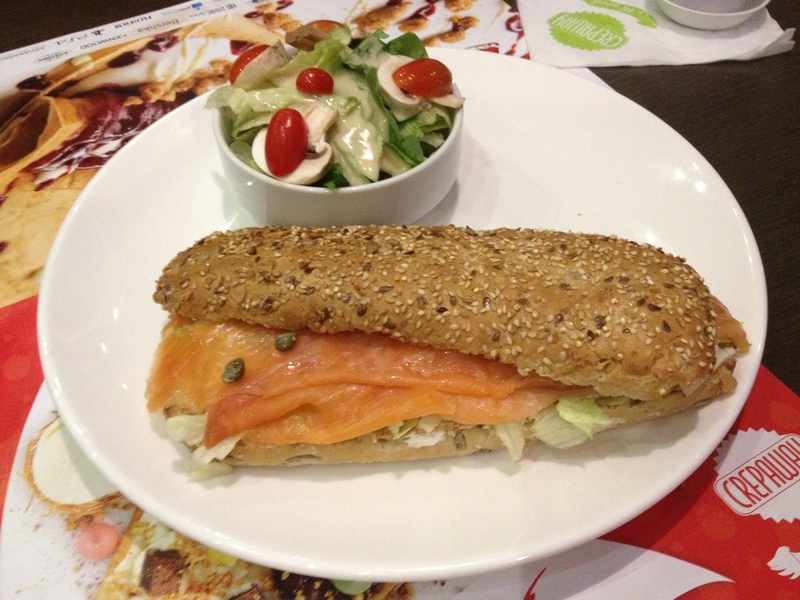 Finally, comes my favorite which is the Smokin Salmon Sandwich, this giant multicereal sandwich filled with smoked salmon is a great omega-3 rich meal! Along with its salad, it only has about 360 calories. This sandwich can be your lunch or dinner in a dieting day and helps you maintain a healthy heart, prevent depression & cancer, boosts up your cognitive functions and helps boost your skin and hair beauty. This is a definitive must-have! ← Calcium & Vitamin D Supplement: A necessity?